NYON, Switzerland (AP) — UEFA has charged AEK Athens and Ajax after fan violence at their Champions League game on Tuesday. UEFA says its disciplinary panel will meet Dec. 13 to judge six charges against AEK, including crowd disturbances, and two against Ajax. A fire bomb exploded near the section of visiting Ajax fans at the Athens Olympic Stadium, and flares and smoke canisters were thrown. 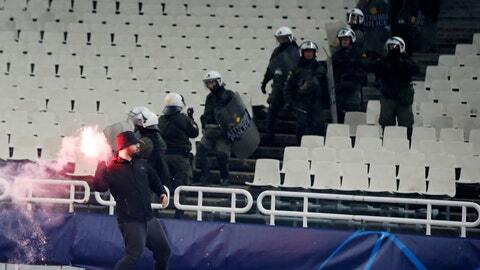 Riot police clashed with fans in the stadium and in Athens ahead of the game, which Ajax won 2-0. AEK faces a potential stadium closure, though its next home European game will not be this season because it will finish last in its group.